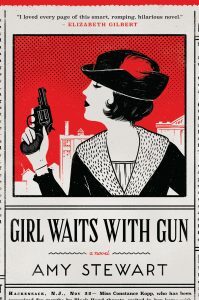 Amy Stewart’s first book in the Kopp Sister’s series, Girl Waits With Gun tells the story of Constance Kopp and her two sisters. Constance doesn’t quite fit the mold of the conventional woman. She towers over most men, has no interest in marriage or domestic affairs, and has been isolated from the world since a family secret sent her and her sisters into hiding fifteen years ago. One day a belligerent and powerful silk factory owner runs down their buggy, and a dispute over damages turns into a war of bricks, bullets, and threats as he unleashes his gang on their family farm. 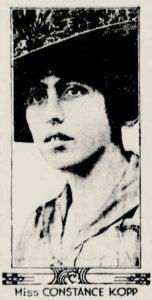 When the sheriff enlists her help in convicting the men, Constance is forced to confront her past and defend her family — and she does it in a way that few women of 1914 would have dared. What’s really interesting about this novel is that Constance Kopp is not a fictional character. She and her sisters are pulled from the newspapers of the early 1900’s (see the image at right of the real Constance). Her encounter with the silk factory owner happened as well. Author Amy Stewart combs newspapers from the time and develops her story based on real people and situations. This is not only an entertaining read but one that gives readers a view into what life was like for women at the turn of the century, when the industrial revolution was threatening the way of life that many were accustomed to.